Spring had arrived. The grass was a bright green and the leaves were out on the trees. The sounds of the birds could be heard throughout the woods. The adult birds chirped, tweeted and flew from branch to branch. Some young birds hopped across the ground. The earth beneath the trees was covered with pine needles, and here and there the faces of wildflowers had begun to peek through the needles. The small birds were excited as they explored the wonders before them. It was their very first time out of the nest. It was also their very first time to see flowers, grass, small animals of the woods, and each other, up close. It was such a surprise to the tiny birds to find that they didnt all look alike. Happily, although each was very different, (there were a Cardinal, a baby Owl, a Blue Jay, a Junco, a Nuthatch, a Tufted Titmouse, and a little Chickadee), there they all were, playing together and learning to be the very best of friends. Feeling full of adventure, the small birds decided they would take a walk through the woods, just to see what they could find. They stayed close together because this was a new experience for them, and they were just a little nervous to be away from their nests. They began strolling and in a few minutes they came across a very small bug. It was red, round, and had tiny black spots on its back. They all looked at the little bug in amazement. "Isnt she beautiful?" said the Cardinal. "Her pretty red color is just like mine! I wonder what she's called." The Owl opened one sleepy eye and took a quick look. "Oh thats just a ladybug," he said. "Theres lots of them here." The little ladybug didnt move from the edge of the leaf, so the birds decided to walk on. A few moments later, the Blue Jay looked around and asked the others, "Wheres Chickadee? Didnt he come with us?" The birds turned around and walked back to where they had been to look for Chickadee. They found him tugging away on the leaf the ladybug sat upon. "Whatever are you doing?" they asked. "We thought you were lost." "I didn't mean to worry you, I was just trying to help the ladybug," explained the Chickadee. "Her babies got stuck under this leaf. She was trying to grab hold of the leaf and fly up in the air with it so they could crawl out, but she's not strong enough to lift it all by herself." Chickadee pulled on the leaf again, this time with a mighty tug. Suddenly the leaf came loose, sending Chickadee tumbling end over end down the hill, still holding the leaf in his beak. The other birds hurried to Chickadees rescue. Fortunately he wasn't hurt, so they helped him brush the dust off and then they all climbed back up the hill. The ladybug was very grateful to have her babies safe. She smiled her thanks to Chickadee as the little birds walked by. A little further down the path a fluffy squirrel scampered past. "What was that?" 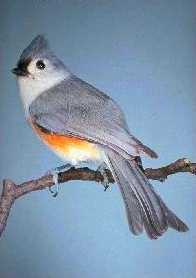 asked the Tufted Titmouse. The Owl blinked his eyes and replied, "Oh, thats just a squirrel. We've got lots of them around here." "His color is sort of like mine, and he looks a bit like me, except Im a little darker gray and he has more fluff," observed the Junco. The little birds busily hurried on, but it wasn't long before they realized that Chickadee was missing again. "NOW where did he go?" they asked themselves. Well," said the Nuthatch , "We might as well turn around and go look for him." So they did. A few moments later they they saw Chickadee and the gray squirrel. The squirrel was watching Chickadee on a limb of a big oak tree as he pulled and tugged at one last acorn that still remained on the tree. "Chickadee, whatever are you doing?" asked the birds. "Well," he replied. "The squirrel has a hungry baby and he needs this acorn. Although he's been pulling and pulling, he cant seem to get it loose. My beak is sharp, so I offered to try to break the acorn loose for him." Then Chickadee grabbed the stem in his sharp little beak and gave a mighty tug. The acorn and Chickadee came tumbling out of the tree and landed with a thump, right on the grass. The other little birds rushed over to Chickadee, and once they saw that he was OK, they dusted him off, and started on their way again. The grateful squirrel clutched the acorn in one paw and waved his thanks with the other. The birds headed down a steep hill toward the pond. As they got closer, they saw a mama duck and four small ducklings swimming in the pond. 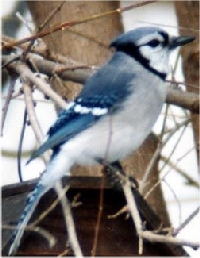 This time it was the Blue Jay who asked, "Whatever is this we see?" The little Owl opened one sleepy eye and replied, "Oh, thats a Mallard duck family. Theres lots of them here." The Nuthatch said, "The ducks look a bit like me, dont you think? We all have beautiful feathers." About then, the little Cardinal looked towards the sun, which was beginning to get lower in the sky. "We probably need to move on now," he said. Our parents will be expecting us back soon." A moment later, they all suddenly stopped and looked around. "Not again!" they said. "Wheres Chickadee?" But he was nowhere to be found. "We'll have to go and look for him again!" they said, and so back they went, heading towards the pond. Sure enough, there was Chickadee, down at the edge of the pond, pecking away at an egg. "Whatever are you doing Chickadee?" they asked him. Well, I have a surprise," he said to them. "The mother duck thought she had four little ducklings, but she really has five. I could hear it tapping away inside this last egg. But this baby duck is so tiny he cant peck his way out of his shell without some help," said the Chickadee. "So that's what I'm doing." "My gracious!," said the birds. Since Chickadee was having trouble pecking through the eggshell himself, he decided to get a running start to try to punch a bigger hole in it. He backed up, and then ran toward the egg full force. Whoops! Chickadee hit the egg too hard, his beak got stuck in the shell, and the two of them, Chickadee and the egg, began rolling down the hill, heading right towards the great big rocks at the edge of pond! Chickadee and the egg smashed into a big rock. Ouch! PEEP! The crash broke the egg, and out popped a tiny little duckling, all safe and sound. The Mother duck was so happy! Fortunately, Chickadee wasn't hurt, he only had a tiny bump on his head. His friends dusted him off again and they all started home. Mother duck quacked her thanks as the little birds marched by. The birds said, "This time Chickadee, you walk in front of us and we will see that you get home safely." They arrived home without any more problems. The birds parents were pleased to see them. The other little birds told each of their parents about Chickadees good deeds during their outing. "What a good little Chickadee you are!" said all the parents. Chickadee looked a little embarrassed. He wasn't looking for praise, you see, he only wanted to help those who needed help. But his parents said, "We're very proud of what you did, and to let everyone know how pleased we are, we're going to christen you with a new nickname." "From now on we're going to call you, Good-Deed-A-Dee," they said. Little Good-Deed-A-Dee's parents smiled at him. They were very proud indeed, because helping others is always a good thing to do. But don't worry, he's not lost. He's probably just busy doing another Good Deed. Yards and trees and ponds are full of the birds and animals and insects that you met in this story. Would you recognize them if you saw them in YOUR yard? Here are some pictures to help you identify them. 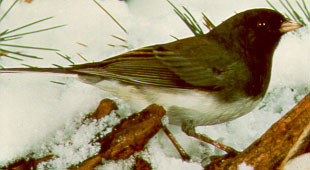 It is possible to sight any of the birds listed in any of the states. The reason for this is during migration the birds may travel through an area even through they may not locate in that area. They are all considered North American birds. Most of USA except Texas and states in line with Texas toward the Canadian border. Not found in central and southern Florida.